As most of us know, last night was the 45th annual Superbowl! (for those of you who didn’t watch, the PACKERS WON!!!!) It was an exciting night, despite the fact that the music was an absolute disaster. Glee’s very own Lea Michele opened the night, singing America the Beautiful. As talented as this young singer may be on stage, and particularly as her character Rachel in Glee, I’m not sure the middle of a football stadium was the right place for her. This is not to say she sounded bad, her voice was just too “cute” in my opinion for such a task; she seemed out of place. 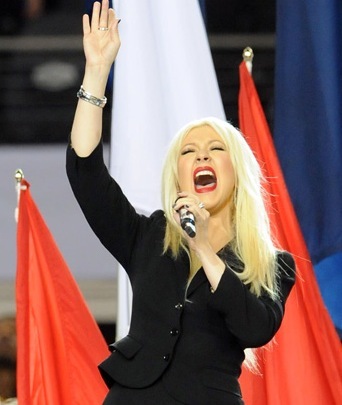 Following Lea Michele, Christina Aguilera sang the National Anthem. The only surprise, was that apparently she also decided to re-write it… whoops! After the first few lines Aguilera completely dropped the ball. Unfortunately her unbelievable voice, and true talent as a singer was not able to get her out of this predicament, any true american who watched the Superbowl was most likely sitting in front of the TV with a look of bewilderment, just as I was about 50 seconds into her performance. Next up was the half time show… The Black Eyed Peas were even worse than I had expected them to be live, they touch up so much of their music electronically before they release it, that you could barely see any talent whatsoever in their live performance. Voices cracking, Fergie trying to change the lyrics to their songs on the spot, it was no longer music, simply noise. 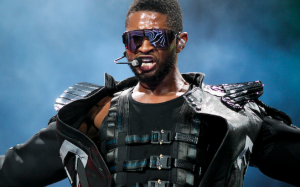 Thank god they featured Usher half way through their performance, because he saved the night singing OMG. It would have been better if Will.i.am and Fergie had stayed out of that number completely! Nonetheless, the light up costumes they wore were priceless, at least that took away some of the attention from the sound they were making. I can’t say I’m surprised the night went so badly though. In this day and age it does not require talent to be considered a musician. With all the technology we have today, one click and a person with no voice at all can sound like Freddy Mercury! It is so different from a few years back, when the only way to hear music was to hear it live, in which case the artists HAD to sound good, or they would not succeed in the industry. I personally find this completely disappointing, because there is no longer a line between fake fame, and fame for true talent!